Well we did get back to Broome following our epic trip to Cape Leveque and ended up staying another 1 1/2 weeks. So what is this place really like. Firstly this is an extremely popular place in the winter or the dry months. The town is transformed from a very low key to an absolutely overrun cosmopolitan melting pot of people, mainly retirees from all over Australia. 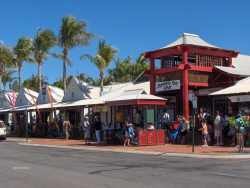 Broome would have without a doubt the highest profile of any place in Western Australia and Australia for that matter. It is the place that everybody is heading to, whether they are traveling North or South. It is not a place they are just traveling through but a place they are heading to, usually with the intention of staying for many months before being driven out, not by the desire to leave but by the impending wet and associated heat. To be perfectly honest we were a little fascinated by what attracts so many people to a small town that is so remote. 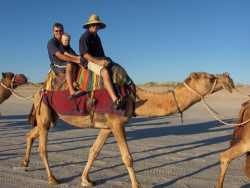 Firstly I will give you what my mental image was of Broome. I expected to drive from the desert (North WA is not tropical green and lush like North QLD) into a tropical oasis, a place of intrigue and mystery situated on a beautiful beach, palms and thick tropical greenery as far as the eye could see. I expected the main street to be overlooking the Indian Ocean with malls and coffee shops that stretched for miles. For some reason I thought it was going to be fairly big with an impressive selection of shops and shopping centres. Perhaps our problem was that we were expecting to much. We have learnt through experience that this is not always a good thing. Broome is a somewhat disjointed place. 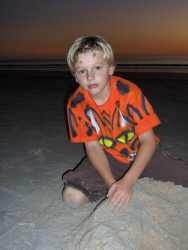 It is divided into three main areas: town, Roebuck Bay and Cable Beach. Plonked right in the middle of all these is the 'Broome International Airport'. They really need to look at shifting the airport and then try pulling the town together. (I can just see that happening). Entering the town (there is only one way in and out) is very uninspiring. So much could be done to get you excited about finally getting there, but there is nothing. Not even the traditional 'Welcome to ------sign. We hope you enjoy your stay' that usually spans both sides of the road. All you see is makeshift bill boards for this tour or that must do tour. My god, you are not even there yet and they have their hands in your pocket (Get used to it, this is an expensive place to visit, if you let it be). All I want is a 'Welcome' sign!! Town is small but nice and modern. As long as you are after jewelery or should I say pearl shops then you are laughing. Remove all them and there would be only a handful of shops left. How do they all survive??? Surely that must be the '10th Wonder of the World'. Town is not or anywhere even close to being on the beach. There is though, a few low key coffee shops scattered around. Finding a car park in town is about as easy as picking up a super model in Port Hedland and a number of laps and cursing is necessary. Roebuck Bay (or town beach as it is known) is about 5 kms from town. Other than a few resorts and a caravan park there is not a lot there. The beach is very pretty and has a lovely park, huge car park and a very nice Cafe looking out over the bay. This is getting better. For some reason the industrial estate is also out this way. Then there is Cable Beach. This is the Saviour of Broome. This is more of what we expected. The beach is first class with miles and miles of lovely white sand and the beautiful vivid blue Indian Ocean as a back drop. The foreshore is landscaped with very much a tropical theme, green grass, palm trees and trendy resorts as far as the eye can see. And yes, there are bars and coffee shops in the parks overlooking the ocean. This is what we thought Broome was going to be like. To sit at Cable Beach at sunset as the camels parade past makes the drive well worth it. It is a sensational sight to be shared with about 500 other cars all parked along the beach, enjoying the same experience as you, some people dressed, others completely naked. You see the northern end of Cable Beach is the local Nudist hang out. Smack bang in the middle of everything is a bunch of mainly oldies showing off all their well worn wares. Most looked like piano accordions on legs. Where are all the Swedish backpackers when you need them?? If you intend to travel to this destination, Cable Beach is the place to stay. We are not sure what we did for our time in town but it certainly did fly. It was a very social time as we met up again with heaps of people we have met and been bumping into along the track. That really is the greatest part about being on the road. 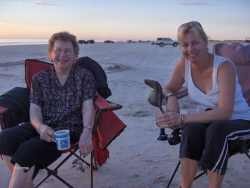 On Wednesday Chris's mother Jan was back on the plane and on her way home to Brisbane. She had a great time spending just over a week with the nomads. We did the Saturday and Sunday Court House Markets twice which was great. 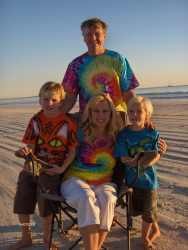 We all bought some bright 70's tie dyed tee shirts and Alex got a set of 'Devil Sticks' from Grandma for his birthday. He absolutely loves them and spends hours practicing his tricks. One night we all went to the open air picture theatre to see the movie 'Cars'. It was a great movie and a great experience. The boys thought sitting in canvas deck chairs in front of the big screen a real treat. 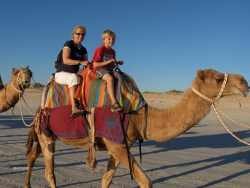 As our final farewell to Broome we went on the sunset camel ride through the sand dunes and along the beach. This hour long trip was actually lots of fun and very scenic. A fitting end to our time here. After an early getaway we first headed for Derby to have a quick look. Our first stop just out of Derby was the 'Boab Prison Tree'. This is a fascinating tree with a fairly sad past. Before Derby was established in 1883, aboriginal people were kidnapped from the West Kimberley. The kidnappers, known as blackbirders, were settlers who were connected to the pearling industry. They wanted divers and workers for the pearling boats. They rounded people up, put them in chains and marched them to the coast. 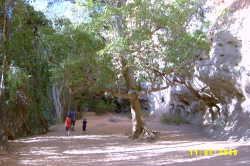 Some held their captives in the 'Boab Prison Tree' waiting for a boat. Although significant, this is not a part of Australian history for which we should be proud of. One of Derby's claims to fame is its huge tides. This area has 11.8 metre tides which is the biggest in Australia and the second biggest in the world. Nova Scotia in Canada has the highest at 15 metres. The tides are semi-diurnal usually giving two high and two low tides every 24 hours. There is also a large loading facility in Derby for loading Zinc and Lead. Due to the size of the tides large ships are unable to berth at the facility. Instead the material is loaded into barges 80 metres long with a capacity of 4,500 tonnes. The barge is then towed to the waiting ship 20 nautical miles off shore. Once alongside the ship an excavator fixed to the barge digs out, and transfers the material to the ship. Each loading and discharge cycle takes 25 hours. For the bigger ships this process may have to be repeated up to 4 times. This whole process sounds very time consuming but must be cost efficient. On the road again just after lunch and off to a free camp called 'Ellendale Lake' only 100 km shy of Fitzroy Crossing. This is a great spot on private property situated on a small lake. We actually bumped into Wayne and Tracey who we thought had gone another way to Windjana. There were dozens of other vans there but plenty of room for everybody to spread out. We had another fire which makes the night, with the kids busily toasting marsh mellows. Next stop, Fitzroy Crossing. Let me tell you there is very little in the great Fitzroy to get excited about. Our reason for coming was to see Geike Gorge and as a base to leave the van when we headed out to Windjana Gorge in the tent. There are a couple of caravan parks in town but without an absolute doubt the one to stay at is 'The Fitzroy River lodge'. This really is an oasis with resort and caravan park very well blended into a very well appointed establishment. This is a great place to spend a few days to relax or catch up on a few chores. The huge grassy sites, tennis courts, pool, restaurant and bars are a welcome site out this way, let me assure you. The plan was to spend the night here, pack the car with all the camping gear and head off to Windjana with Wayne and Tracey. All was going well in the planning until on the way home from the historic 'Crossing Inn', Wayne and Tracey's 2001 Nissan Patrol blew up. Lots of black smelly smoke and some really bad noises from under the bonnet spelt the end of their trip to Windjana. A mechanic from the RAA arrived and the news was not good. 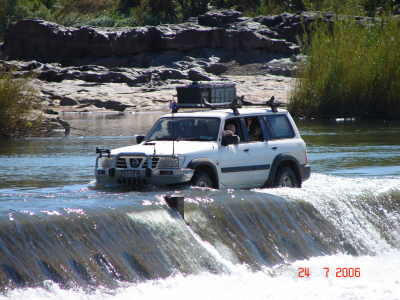 The car and van would have to be trucked off to Kununurra to the local Nissan agent. Bugger. Although only 150 kms from Fitzroy the road is a very average 4x4 track that took us over 2 hours. The Windjana camp ground is very nice with large open areas, drinking water and even flushing toilets. Bloody luxury. 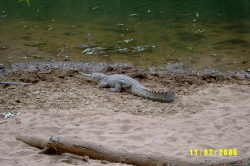 We set up the tents, tarps and associated gear and set off into the gorge to check out the fresh water crocodiles. We stayed 3 nights and spent one day doing the 8 km Gorge walk. The highlight was seeing hundreds of freshies, some large, very up close and personal. These guys are very docile and considered harmless if not provoked. Day 2 we set off early for a 300 km return trip up the Gibb River Road to 'Bells Gorge'. The Gibb (as us seasoned four wheel drivers call it) is in good condition at the Derby end but the road into Bells was another story. It is a very pretty gorge and nice camp ground close by and a place we would like to revisit in the future. We did the walk to the bottom of the falls and John and Margaret who we first met back at Cape Range were there sunning themselves on the rocks. We chatted to them and then set off to the car for the trip back to the tent. Day 3 had us out of the tent early, gear all packed up with the aim to be at Tunnel Creek to meet up with the Joiners who are currently on a 7 week trip. It will be good to see them and the kids especially are very excited to see their friends again. We will travel with them for a bit over 2 weeks before they have to start heading back home. Tunnel creek is very spectacular and well worth a visit. This huge tunnel has been gouged out of the mountain over thousands of years. It is absolutely huge, dark, wet and very spectacular. At places you need to wade through knee deep water. 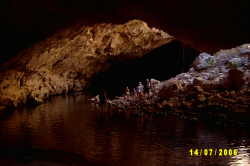 Hidden along the way and extremely hard to find are a number of caves some with very small openings. 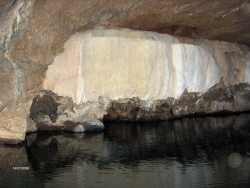 We found one that had tremendous stalactites and stalacmites, as well as pillars and sparkling crystal-like walls. There is' light at the end of the tunnel' (sorry for that) with Tunnel Creek making its way through the countryside. Aboriginal rock art could be seen in a number of places at the exit to the tunnel. 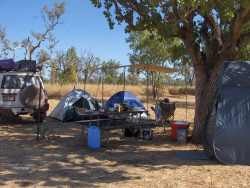 We made our way back to Fitzroy Crossing to spend a few days relaxing and washing (and to get a good nights sleep). 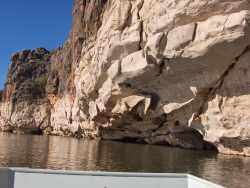 We did spend a few more days in Fitzroy catching up on jobs and doing a cruise up Geike Gorge. This excellent boat trip run by CALM takes an hour and costs only $20-00 per adult. The commentary was excellent and the scenery breathtaking. This is very good value and a must see when out this way. Time to pack up again and get ready to hit the road. Next stop will be the Bungle Bungles. Unfortunately we have been told the trip into the Bungles is very rough so the van will be left at Turkey Creek and again the tent will come out. Believe it or not there is some primitive excitement about tenting it. The kids say they are 'going on holidays'?!?!? What the hell have we been on for the last 7 months!! We broke the trip from Fitzroy to Turkey with an overnight free camp at Leycester rest area. I know I have said it many times but there is something special about pulling into a free camp, having a fire, chatting to other travelers about their adventures and then off to bed. If only life was always this simple and uncomplicated. Maybe for us it will be. We have a few things planned. We arrived nice and early at Turkey Creek and booked the van into the lock-up compound. This is a great setup and at only $5.00 a night is good peace of mind. After we transferred all the necessary gear from van to car we set off. Although the trip into the Bungles was only 50 km off the main road it still took us 1 1/2 hours as the road is pretty ordinary. It would have to be the worst dirt road we have encountered on this trip so far. The camp ground was again a big open area with large communal fireplaces. These open camps are lots of fun, watching all the coming and goings as well as being very social. By the time we set up camp and showered the multitudes it was getting late and starting to get cold. Very bloody cold. In fact freezing would be closer to the truth. By nightfall I had a t-shirt, 2 sloppy joes, a jacket, tracksuit pants and jeans as well as a beanie, two pairs of socks and boots and was still freezing. The camp host told us it got down to 2 degrees C but we also heard -2 mentioned. I think that would be closer. It was like that for the 3 nights we were there but the days were magic. Did I mention that it was bloody freezing??? Day 1 and we did 3 walks, Echidna Chasm, Mini Palms and The Frog Hole. Although none of these were particularly long or challenging it did take us all day to do the three. They were OK walks but not what I really expected the Bungles to be like. Hopefully tomorrow will fulfill what I expected to see. Day 2 and off to the other side of the National Park we drove. 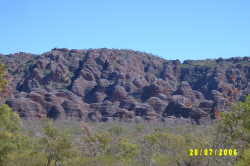 Now this is the real Bungles. Domes, domes and more domes. Hundreds of them, big ones and small ones extending as far as the eye can see. It is truly spectacular and looks just like all the photos we have seen. 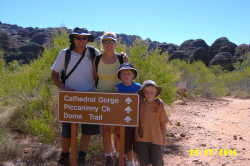 Our first stop was Cathedral Gorge. 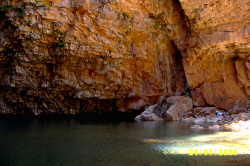 After a short walk down a pretty gorge you are confronted by a huge ampitheatre with a large pond in the middle. It was an awesome sight even though we had to share it with 50 other people. To see this in the wet with water cascading over the edge and into the ampitheatre would be an amazing sight. We then did the walk around the domes which also was fascinating. These sandstone towers are fragile giants, each encased in a thin, protective skin of orange bands of iron oxide and gray to black bands of cyanobacteria. If the banded skin is damaged, the sandstone will be rapidly eroded. We then did a walk along Piccaninny Creek to a lookout which gave a great elevated view overlooking the domes. This was a good compromise for those who don't want to, or can't afford the $250.00 for a 30 minute flight to view them from above. So the Bungles certainly lived up to all our expectations. Even the freezing nights couldn't dampen our enthusiasm for this incredible natural beauty. We collected the van from the compound, moved all the gear back from the car to the van and set off towards Kununurra. We didn't quite make it all the way and stayed in another free camp only 60 km short of our destination. Once again a great night was spent free of charge, sharing the side of the road with a handful of strangers some of which will end up as friends on the road. Next morning we packed up and rocked into town nice and early and booked into 'Kona Lakeside Caravan Park'. There are about 7 caravan parks in town that appear to all be of a very high standard. The minute you arrive in this town it has a very nice feel about it. It is green and lush (thanks to the Ord River scheme), neat and tidy and during the winter months has a sensational climate. The amount of things to do and see around here is staggering. Everyone seems to own a dingy and there are hundreds of kms of waterways to explore and to fish. They even water ski on Lake Kununurra which they say has no salt water crocs. Good reason not to fall off, just in case!! Due to the fact that we arrived in the caravan park early we scored a lakeside spot. I would have to say that this is one of the nicest outlooks we have had in a park since being on the road. We quickly set the van up and went into town for the Saturday morning markets. Plenty of local fruit and veges so we restocked. We spent a few days doing the touristy things, one of which was 'Ivanhoe Crossing' which is a long causeway over the Ivanhoe River. The water was fairly deep and also fast flowing. Later in the season (when the water warms up a little) this is a good Barra fishing spot. We drove the crossing a few times (because we could!!) and the boys had a hoot!! Due to the fact that the Joiners have limited time we will leave the vans in Kununurra and head out to 'El Questro' for 4 nights and then we will head back to Kununurra to finish off the sights and the Joiners will start to make their way home. This is one of those places everybody talks about and one that you seldom hear a bad word about. I hope we won't be disappointed. We left the van again in storage, this time in Kununurra and again headed off on the Gibb. 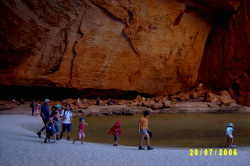 Believe us, El Questro is well worth visiting and is worth the expensive fees they charge for camping. We spent 4 nights there which was a good length of stay but could have easily stayed 3 weeks and had a ball. Alex and the Joiner girls went horse riding and they all enjoyed the new experience. For the rest of our stay they all got out of bed at 5-45am and helped clean out the stables, feed and saddle up the horses. Such enthusiasm and such excitement, over something so simple. It was a joy to watch them in action. Day 1 was spent getting there, setting up the camp and then off to the water hole at the camp ground for a swim. They assured us that there are no crocs in this part of the river!!!! Why not 'just in this part', I couldn't help thinking. The water was lovely, be it a little cool and I always made sure there was some tasty large person in front of me just in case they had the 'no croc thing' wrong. Day 2 we took off for a bit of serious 4x4 ing up to Branco's lookout which overlooked the Pentecost River and Chamberlain Gorge (known croc country). 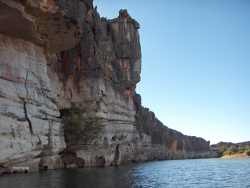 The famous 'El Questro Homestead' is on this gorge and we could see it from afar. At over $1000-00 per person per night this will be as close as we get to see it. We then drove to Explosion Gorge which after endless miles of horrible tracks was very average. Oh well, nothing ventured, nothing gained. Day 3 was pretty special. First up we set off to Zebedee Springs. This place has to be seen to be believed. The hot artesian water which is constantly 32 degrees C cascades down into magnificent fern and palm studded rock pools in which you can laze around and ponder that elusive question. What is the true meaning of life?? This would without a doubt be the most popular part of El Questro. By 9-00am all the pools are filled with grey nomads reminding us of a scene out of the movie 'Cocoon'. With our kids and the Joiners leaping from pool to pool we certainly shattered the peace and somewhat altered the ambiance of the morning. We lounged around for a few hours until we were more wrinkly than a scrotum (Chris prefers 'prune') and then drove a short distance to El Questro Gorge for what was to be a long and difficult walk. 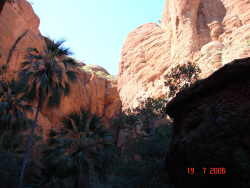 This gorge is renowned as the most beautiful in this area. 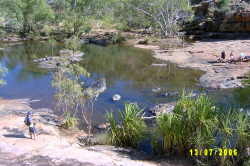 The first part of the walk, where most people stop is less than 2 kms and ends at a deep crystal clear swimming hole. If you wish to continue the next 3.5 kms to the end of the gorge and another swimming hole you had to swim across the first hole somehow carrying all your gear above your head and then climb up a very steep and slippery rock. We certainly were the centre of attention as we endeavoured to get our gear and Harry over this first obstacle. The rest of the walk was the most challenging we have attempted on our trip so far. It was not really a walk but more a scramble, climb and struggle as we climbed and clawed our way over rocks the size of houses and up steep rock walls and waterfalls. On our way up the gorge we came across an 'Adventure tour' consisting of mostly young people. I am not sure they were all that impressed to see a 4 year old going up and down the terrain like a mountain goat after they had been told that this walk was going to be the most challenging for the day and would push them to their limits! The boys did really well, and Harry especially impressed us with his effort. Alex was in his element. By the time we got back to the car we all had bruises, cuts and were buggered. A real sense of achievement. Day 4 we drove back out to and along the 'Gibb' to Emma Gorge Resort and did the walk to Emma Gorge. 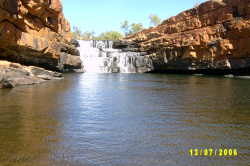 The walk was relatively easy but at the end the waterfall and large pool was again worth the effort. The pool was 3/4 the size of a football field and had a number of waterfalls cascading into it. Once again it was cool but refreshing as the day was hot. We got back to the campsite and had early showers as we were off to the Saturday night barbecue. At $30-00 per adult it was a little expensive but well worth it with barramundi, steak, chicken and salads on offer as well as soup and dessert. Sitting outside under the stars watching the night's entertainment of whip cracking, bush yarns and then a couple of guys strumming away on their guitars and singing was a great way to spend our last night at El Questro. If you are out this way, this is a place not to miss. On our way back to Kununurra we dropped into Wyndham, had lunch at the pub and had a look around town and the surrounding area, including the lookout to view the junction of five rivers - quite an amazing sight. We arrived back to the caravan park much later than expected (around 5-00pm) and managed to score another lakeside site. Gotta be happy with that!! First day back and it was Chris's birthday. Due to the fact that we had been away camping for 5 days we had a hell of a mess with boxes to be unpacked and a mountain of washing to do. We did the normal breakfast in bed and pressie opening and then my little princess sat around enjoying herself while I ran myself ragged doing the washing, cleaning and unpacking. True story. Would I lie!?!?! (His nose is growing by the second - Ed) Sharon had the catering under control (lucky for me, or Chris or both of us) and the evening festivities started with drinks and nibblies at sunset at the lookout overlooking town. Sharon had also made pizza for the kids dinner which they had at the lookout. Wayne, Tracey and Bailey also made it up there which was great. We then made our way back to the van, got the kids off to bed and enjoyed a Sharon 'creation' for dinner. We really appreciated the effort she put in and Chris loved her celebrations. Of course the cake Alex and I made stole the evening and would have been a sure winner in the 'Kununurra Show' cake competition. Oh well, maybe next year!! Tuesday saw the Joiners pack up and start their journey home. They have just over 3 weeks left and have a lot of places yet to see and miles to travel. It was great to see them after so long and we all had a great time, and most importantly they saw some new sights. Our last few days in town were spent finishing off a few tourist attractions including Lake Argyle & Dam. This massive expanse of water which is 10 times bigger than Sydney Harbour, is to say the least, very impressive. We then spent a bit of time with Wayne and Tracey who we have been traveling with since April as they will be stuck in town for the next 6 weeks while their car undergoes some major repairs. Hopefully they will catch up with us down the road somewhere or we will see them in Adelaide. Their car blowing up 3/4 through their trip was a tad inconvenient, to say the least. We have really enjoyed our time in this small and somewhat remote town, that sits almost on the NT border. This is one place that we could certainly see ourselves living in for the 6 months of the dry season at some stage. All the months seem to be flying by, but this one in particular has rocketed along and signals the end of nearly 8 months on the road. It's a scary thought as we now have only 4 months left before we are back at Cotton Tree on the Sunshine Coast for Christmas. Does this idyllic life style really have to end??? In the next day we will be leaving WA, a state we have now been in for over 6 months. It will be sad to leave, but we all very much look forward to our next visit. This is a state that has a huge amount to offer each and everyone of you, and is absolutely not to be missed. All those people living in the East don't know what they are missing out on. The scenery is hard to imagine and difficult to explain, the people friendly and the sunsets alone, make the trip worthwhile. The next chapter in our book will be NT. We only hope we enjoy it as much. Be kind to each other and remember to take some time in your lives to breathe and to smell the roses.